WELCOME to our updated website - launched 6th April 2015. At the launch of the site, in March 2010, there were more than 3,000 names, mostly families of canal workers on the Leeds and Liverpool Canal, all connected by marriage, in one tree, Canal Family 1. Since then this tree has grown to more than 43,400 people, and it has spread from Lancashire and Yorkshire into Cheshire, Staffordshire and beyond. Two more trees, Canal Family 2 with 95 people (merged with Canal Family 1 on 6th June 2014 and deleted) and Canal Family 3 with 24 people, were started in June 2012. A fourth tree, Canal Family 4 (273 people), was created on 3rd October 2013, but was soon merged into Canal Family 1 and deleted. A new tree, Canal Family 5 (120 people), was created on 8th February 2014, and another, Canal Family 6 (124 people), on 8th July 2017. This was merged into Canal Family 1 on 26th Oct 2017 and deleted. Canal Family 7 (initially containing 523 names) was added on Nov 10 2017 and soon updated to 1,063 people. Another tree, intended to become Canal Family 8 with 952 people, was found to be linked so both these trees were merged into Canal Family 1 on 25th January 2019. We do not knowingly include living people without family permission. The information has been compiled from the private research of ODFHS members and other contributors, from the websites of Lancashire On-line Parish Clerks, Lancashire BMDs, the Censuses - and increasingly from parish records on Ancestry and FamilySearch (IGI). Some details are inevitably more complete than others, but where copies of birth, marriage or death certificates are held, this is indicated in an individual's Life History by the letters BC, MC or DC. Please note that clicking the link at the bottom of each page (to the TNG website) will take you away from this site! The Society is indebted to the small group of dedicated enthusiasts who have developed this site. Using this site and the other ODFHS products; such as the CD of Burscough Boat Families, should enable you to discover many of your ancestors. Bill Huyton, Chairman ODFHS, March 2011. 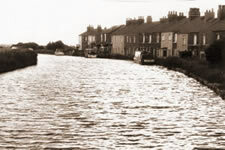 The purpose of this site is to assist researchers whose ancestors worked on the Leeds-Liverpool Canal & associated waterways, especially in South-West Lancashire and Cheshire, and more recently in Yorkshire east of Leeds. Lower down this column there is more information on how to submit questions and family trees for inclusion. Use the Surnames link (top right) to see a list of main names in all trees, with an option to select a specific name from the alphabetic panel above. You can search for a particular person by using the search box, or you can see names in specific trees by changing 'all trees' to, eg, 'canal family 3' etc. At various places on the site you will see a small tree icon, which will show the family tree of your chosen individual. You can click on any name shown to reveal their details. Once you have chosen the first name it is possible to navigate that entire tree. Returning to the Group Names page will allow you to visit another tree. PLEASE NOTE: The search box on the right is a simple search on Canal Family 1. For many more options and to search all trees together please go to the Advanced Search page choose from the various drop-down boxes. More information relating to the updates shown on the right can be found in the Update History files which can be viewed by going to the MEDIA link above and selecting DOCUMENTS. If you have any questions or comments about the information on this site, please contact us. We look forward to hearing from you. Click on Info and Contact Us. We have spent a great deal of time in building & populating this site. We have made every effort to produce a site that is accurate & easy to use. However No warranty is given, or implied. We are grateful to have so many free sources of information: Lancashire Archives, Preston; the London FamilySearch Centre, whose microfilms are now at the Society of Genealogists HQ in London; UKBMD; Lancashire OnLine Parish Clerks, and others. Our researchers also subscribe to the Ancestry and Findmypast websites. A summary of our newest tree Canal Family 9 can be found under Media/Documents/Benjamin Curry Walls. Our new name, Clucas, can be traced back to the Isle of Man, and several branches settled in Runcorn as boatbuilders and ship's carpenters. Their families have provided more links between the watermen of Cheshire and those of West Lancashire..
Ann Jane Clucas married in 1879 Runcorn waterman William Hughes, and their son Hugh, a tug captain on the Manchester Ship Canal, married Elizabeth Pendlebury, daughter of waterman Robert Pendlebury and Ann Snape, b1875. Ann was daughter of Lancashire boatman Robert Snape of Halsall, and her cousin Mary Frances Snape married in 1890 Robert's brother James Pendlebury. In another Pendlebury line, Jane, daughter of waterman John Pendlebury b1797 Grappenhall, Cheshire, married in 1860 Richard Hurst, a ship's carpenter from Foulridge, near the summit of the Leeds and Liverpool Canal. Another Lancashire-Cheshire link is through Sarah Cheetham, grand-daughter of William Cheetham and Mary (Ashcroft) of Lathom, who married in 1904 Joseph Furnival of Runcorn, brother-in-law of Widnes waterman Joseph Albiston. 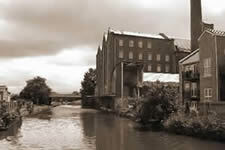 A connection between the shipwrights of Cheshire and Lancashire is shown in the 1871 census when Mary Ann Roberts, 19-year-old daughter of Thomas Roberts and Elizabeth nee Edwards (from two Cheshire boatbuilding families) is living as a servant in the home of Rachel Crook, widow of Thomas Miller Crook, head of the boatbuilders at Riley Green, near Blackburn. Canal Families 2, 4, 6, 7 & 8 have all now been merged into our main tree, Canal Family 1 (details, see left hand column).